Recombinant fragment corresponding to Human Syndecan-1 aa 1-250. Our Abpromise guarantee covers the use of ab16038 in the following tested applications. Cell surface proteoglycan that bears both heparan sulfate and chondroitin sulfate and that links the cytoskeleton to the interstitial matrix. 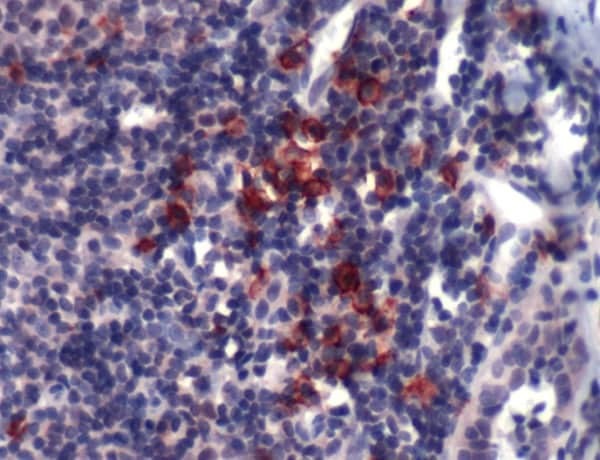 Formalin-fixed, paraffin-embedded human tonsil tissue stained for Syndecan-1 using ab16038 in immunohistochemical analysis. ab16038 has not yet been referenced specifically in any publications. Publishing research using ab16038? Please let us know so that we can cite the reference in this datasheet. There are currently no Customer reviews or Questions for ab16038.